I thought I should shed some light on the VIN today as FBR has planned to soon introduce VIN in Pakistan. Yes, Vehicle Identification number. In the end I will decode VIN of my car as an example. But let me begin by some primary knowledge of VIN as some people call it. Basically it’s just a VIN. The National Highway Traffic Safety Administration (NHTSA) requires all automobile manufacturers who manufacture or imports in to US to issue a unique 17 digit VIN number to all vehicles produced. The unique 17 digit VIN number contains all letters and numbers except the letters i, o, and q which apparently can be confused with the numbers 1,0, and 9. It’s like your thumb impression. Don’t match with anyone else on this planet. Vehicle identification numbers (VINs) were first used by auto manufacturers in 1954. Between 1954 and 1981, there was no standard format and VINs varied considerably between manufacturers. Under standards set by the National Highway Transportation and Safety Administration (NHTSA), every car and light truck model year 1981 or later has a unique 17-digit VIN in a fixed format. Why was this standardization necessary? It was done to ensure that no car was ever mistaken for another. Digits in a car VIN tell specific information, including the vehicle’s year, make, model, country of origin, assembly plant, and more. The VIN also enables you to run the Vehicle History Report. The VIN number has numerous purposes. Like I can share few as under Department of Motor Vehicles (DMV) can keep track of ownership and law enforcement agencies can identify stolen vehicles or parts. It also helps automobile manufacturers keep track of vehicles for recall, upgrades, or other important information. Furthermore, the VIN number is great for the vehicle service industry to make sure you get the right parts and service for the right vehicle. What brake system it needs, what transmission fluid is needed, and the list goes on and on. These days, VIN is also becoming a way of tracking what happened to the vehicle during its life. The Vehicle History gives you information such as services performed, was it ever in an accident, was it stolen or salvaged, any flood or water damage, is the odometer reading correct, how many owners, vehicle usage (was it a taxi or rental? ), lemon history, recalls , was the vehicle totaled or had huge insurance claim? The VIN number is printed on the vehicle itself. The two most common places are on the driver’s side dashboard (you can see it from the outside) and on the driver’s side door jamb. Other places include on the steering column, radiator, engine block, and so on. The VIN number is also on numerous documents, such as your sales agreement, title, insurance policy, service records, maintenance book, the original window sticker, police reports, and many more. The 17 digit VIN number gives information such as where it was manufactured, vehicle’s year, make and model. 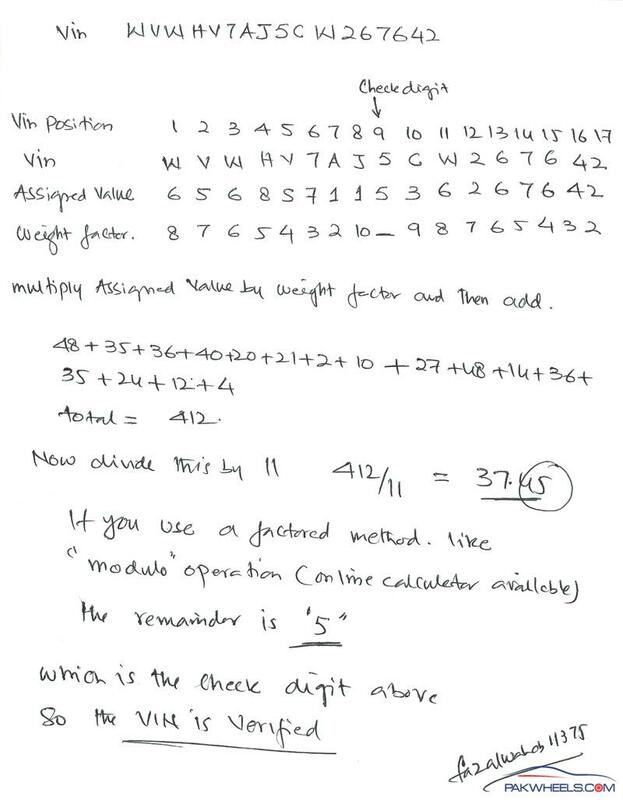 Deciphering the 17 VIN digits to retrieve the wanted information is called VIN decoding. There are 17 numbers and letters (17 positions) in a VIN and we can divide them into three groups: World Manufacturer Identifier, Vehicle Descriptor Section, and Vehicle Identifier Section. The first three letters and numbers of the VIN are the World Manufacturer Identifier. 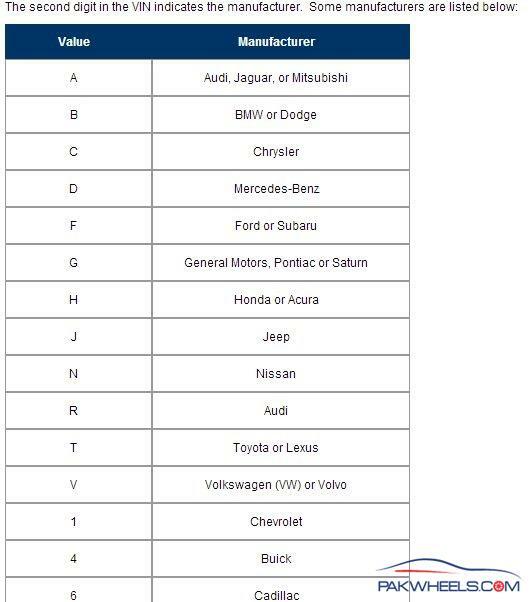 The very first letter or number of the VIN tells you in what region of the world your vehicle was made. Match the letter or number below to the first number or letter of your VIN to find out in what region of the world your VIN was made. The second letter or number, in combination with the first letter or number in the VIN, tells you in what country the car or truck was made. You may be surprised to know that not all Japanese cars are made in Japan and not all GM cars are made in America and so on. Anyway, cars and trucks are made in over 80 countries and there are over 600 VIN country codes. You can see all the codes and find where your car or truck was made by going to Where is my car or truck made. some famous makers with a code. The third number or letter is used by the vehicle manufacturer to identify what kind of vehicle it is. It could be a car, truck, bus and so on. Each vehicle maker uses different codes for this so go to the Automobile Manufacturer website for your vehicle to find out what the third position in the VIN means for your particular vehicle. Letters and numbers in positions 4 through 9 is the Vehicle Descriptor Section. This information gives detailed information about the vehicle itself. Here you can find out the vehicle model, engine type, body style and things like that. 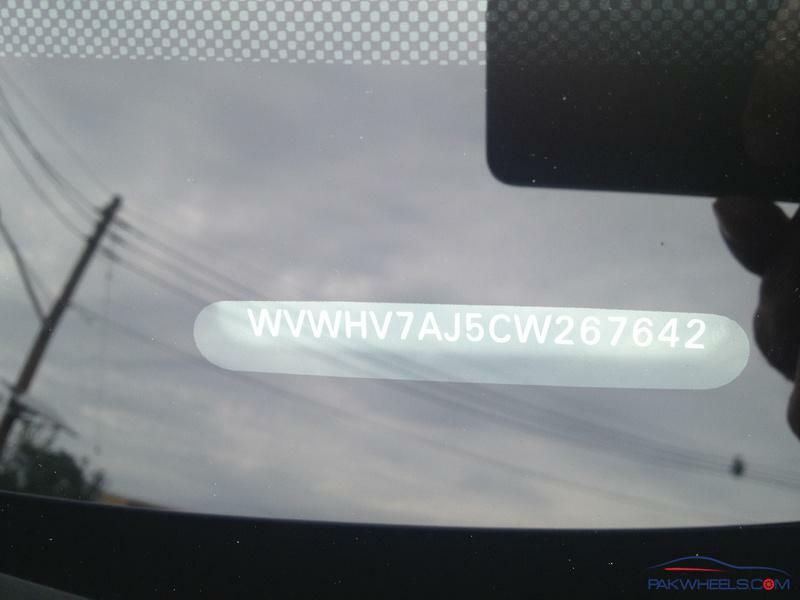 Each vehicle maker uses different codes for this so go to the Automobile Manufacturer for your vehicle to get the codes. This is the VIN Check Digit where you can use math to figure out if it is a correct VIN. It does not tell you anything about the vehicle itself. The check digit is very important digit. It confirms via a built in formula into the VIN if the VIN is genuine and not forfeited . 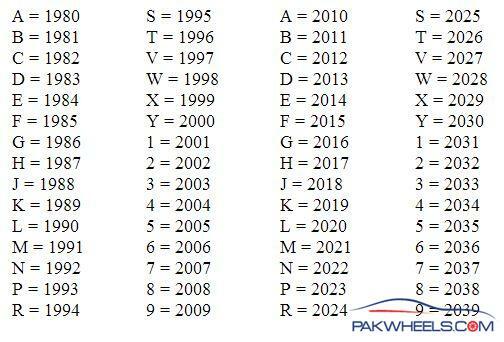 As you can see, each letter or number has been assigned to two different years. To find out which one applies to your VIN, you must look at the 7th letter or number in your VIN. 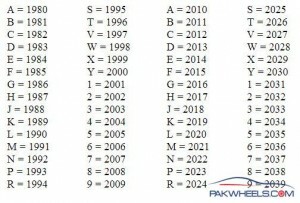 If the 7th VIN position is a letter, then your vehicle is made in 2010 through 2039. If the 7th digit in a VIN is a number, then your vehicle is made prior to 2010. This is where the auto manufacturers enter unique information about the particular vehicle the VIN belongs to. The name of the assembly plant, extra options added to the vehicle, Production Sequence Number and things of that nature. This is different from company to company. 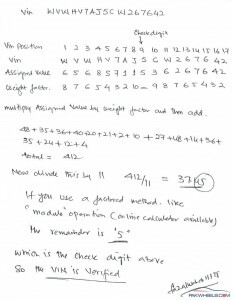 The check digit is the at the 9th position in a VIN, below s very simple mathematical formula. Now lets do an example Vin for our understanding. Below is the shot of my car VIN. lets see if this is the right VIN and what info we can gather. The VIN as visible below is WVWHV7AJ5CW267642. 5 = is the check digit and we will run a formula below. C = Model year. from above table you can see its a 2012. Now by using the method above lets check the number authenticity. I did it on a paper and scanned it as below. I believe that, implementation of VIN is the need of hour by Pakistani car assemblers and Government should implement and regulate this as soon as possible. 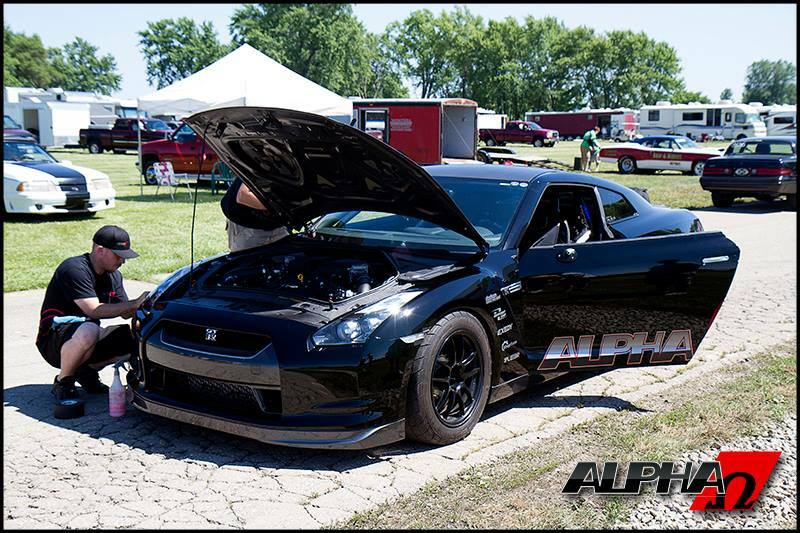 Another Nissan GT-R another world record!